The bike will also mark TVS' first entrance in the category of Sportsbike and will be in direct competition with KTM’s RC 390 and BMW G310 R. Let us look at both TVS Apache RR 310 and KTM RC 390. TVS Motor Company has launched its flagship motorcycle TVS Apache RR 310, priced at Rs 2.05 lakh (ex-showroom). The design of Apache has been inspired from a shark which in Russian means Akula. It looks fresh and loaded with power more than ever with an attractive price tag. Engine – Powering the Apache RR 310 is a 312.2 CC, liquid cooled, single cylinder-engine, developed by BMW which can produce power of 33.5 bhp at 9700 rpm. It will consist 6-speed gearbox. On the other hand, KTM RC 390 runs on 373cc engine, four stroke, lequid cooled and fuel injected that makes 44 hp of power at 9000 rpm and peak torque of 36Nm is produced at 7,000rpm. When it comes to power, clearly KTM Duke RC 390 scores over the TVS Apache RR 310. Dimensions – Apache RR 310 stands at a height of 1135mm and has 786mm of width. The wheelbase and ground clearance is 1365 mm and 180mm respectively. While KTM RC 390 measures 1978mm in length, 688mm of width whereas the wheelbase and ground clearance of 1340mm and 178mm. Suspension and Brakes – The fully faired Apache RR 310 has 41mm upside down forks upfront and a race tuned KYB monoshock in the back. Braking power comes from a 300mm front disc and a 240mm disc at the rear. In contrast, KTM's RC 390 has a WP with USP forks in front and monoshock at the rear. Talking about its braking power, it has 320 mm disc in front and 230mm disc at the rear. Price – In order to compete with KTM’s RC 390, TVS has priced its entry-level sports bike at Rs 2.05 lakh (ex-showroom) while KTM RC 390 is available at a price of Rs 2.25 lakh(ex-showroom). 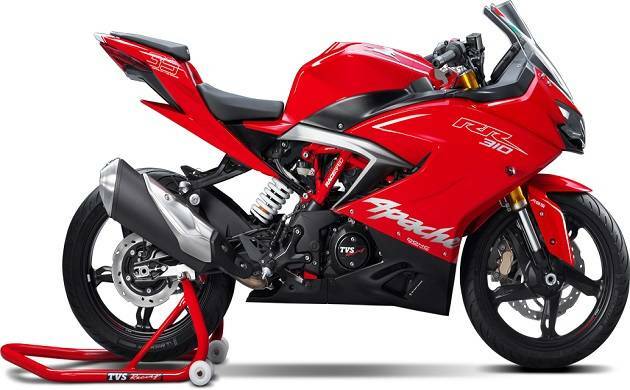 Apache RR 310 goes on sale from late December and will be available from 50 dealers all over India.